How To Build An Engineered Retaining Wall And Obtain A Stamped Drawing For Submittal To A Local Municipality. The best place to source design information or necessary drawings for MaytRx and VyKing Wall Systems is cambridgepavers.com. HTS (Hardscape Technical Services) has created a manual (Click Here to Download the Manual PDF 7.4 mb) "Complete Guide to Planning, Bidding, Engineering, and Building the MaytRx Wall" which is an excellent primer for building an engineered wall as well as a stamped drawing program that costs less than $500 in most cases. Their affiliate company SRW offers free takeoffs and geogrid layouts. SRW/HTS has an arrangement with Cambridge Pavers to provide MaytRx and VyKing engineered wall designs if the geogrid needed for the project is purchased from Cambridge. Cambridge suggests that you consult an engineer, design professional or HTS for MaytRx and VyKing walls higher than 36" or that involve loads, poor soil or other design factors such as water runoff. See program information below. SRW Free Design Request Program Fill out the SRW Design Request Form. Note: This is not a "Stamped" drawing; it is a calculation based on your information using NCMA design software. HTS Stamped Drawing Program Typically, when a homeowner or contractor discovers that their retaining wall project needs a permit by the local building department, it is also learned that to obtain a permit they must provide engineering stamped by an engineer registered in the state of the project. The stamped engineering requirement will vary, from locality to locality. The determining factor for requiring stamped engineering is usually the exposed height of the retaining wall. Some local building departments require stamped engineering on retaining walls as short as 2' in exposed height. Fill out the HTS Stamped Drawing Program Request Form and prepare a soil sample. Verifies that all the required information is supplied, and forwards the package to the independently licensed engineer. 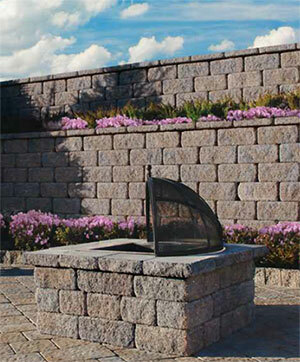 A cover letter from Hardscape Technical Services (HTS). A stamped cover letter from the engineer indicating the proper design table to use for construction. The proper design table stamped on the site configuration (case) to be used. Upon receipt of the stamped engineering document, you may proceed in obtaining the building permit from the local building department.